Founder and puppeteer, Cathy Lee Keogh Hammond of Arm’s Length Puppets is fascinated with the many realms that puppetry can offer. She has been performing with puppets since 1998. Cathy Lee recently won an adjudicator's award for the 2007/2008 Encore Theatre Series Awards for her puppet making skills for three sheep puppets used in the production of "Joseph and the Technicolor Dreamcoat" produced by Meadowvale Music Theatre. 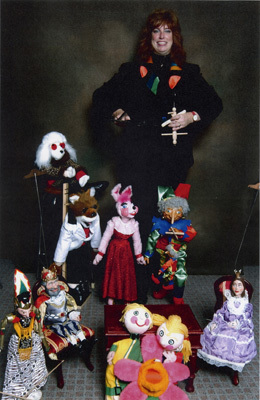 After seeing Bill Baird’s goat marionettes showcased in The Sound of Music, Cathy Lee wanted to create a similar magic. She believes that puppets can communicate to different people of all ages on many levels. Cathy Lee is a self-taught puppeteer. She also studied the art of puppetry with David and Ann Powell of The Puppetmongers. There, she gained valuable knowledge regarding puppet-making and understanding the world of puppets. Cathy Lee has been a member of The Ontario Puppetry Association since 1998. Over the course of her career, Cathy Lee has performed for a wide range of clients that include Chapters/Indigo, The Canadian Cancer Society, Peel Regional Police and Big Brothers/Big Sisters. She also teaches puppet-making workshops for children from the ages of 4 to 15. Her workshops include hand puppets, rod puppets and shadow puppets. She was also involved with a production for the Comedy Channel making prototype marionette puppets. Cathy Lee is very pleased to inspire laughter and learning through the art of puppetry.